This is a quick, “throw it together” kind of recipe. My mom used to make hamburger soup every so often when I was a kid, and I loved it: the tomato base, the chunky vegetables in it. During one of the winters I was away at college, I had a craving for a hot, hearty kind of soup. I thought of this one, and with my mother’s help I was able to recreate it without the meat. You can exchange the canned vegetables for frozen or fresh, and add others as you like (mushrooms and green beans would be a great addition); the onions were just a little something that needed to be used up in our fridge. I joked with my sister, as we were cooking, that this is kind of like a “use everything but the kitchen sink” soup, but for some reason she didn’t like it when I suggested throwing in a random can of pineapple. I can’t imagine why. Hawaiian burgers are totally a thing, right? 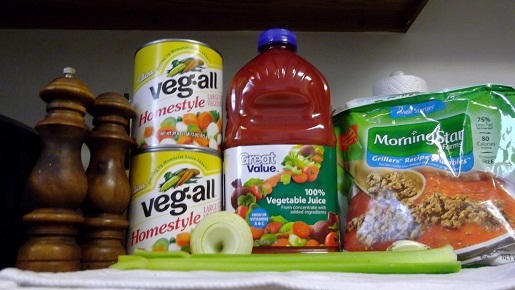 Add the V8 juice, onion, garlic and veggie crumbles into a large pot. Flavor soup to taste–I suggest garlic pepper, tarragon, marjoram, basil, rosemary, garlic powder, and chives. Really, it's whatever you enjoy and whatever you happen to have on hand! Continue to cook until soup is heated through and flavorings have mingled, about 30-40 minutes. Feel free to garnish bowls with a bit of parsley and a sprinkle of mozzarella. This is one delicious and hearty and healthy soup recipe. I used to make homemade soup like this years ago. Your recipe has me wanting to make this great soup again. Thanks for your great recipe today! That looks really good and I eat primarily meat only. I am on a diet and this looks good and easy I will make it.Thanks. This looks delicious, I have been looking for a healthy recipe my whole family will enjoy and I think this is it! Looks delicious, I'm tempted to try out this weekend! I have been looking for a good meal to prepare when some friends of ours (who are vegetarian) come over for a "get together!" I had planned pizza, but I would love to make this for them instead!! Thanks for the recipe! It is one of those meals that is perfect for vegetarians and non-vegetarians alike! Best of all, it’s super easy! This sounds like a great recipe. My mother-in-law used to make a soup similar to this. haha! If you really wanted to make it a meat recipe, you could probably just substitute the tofu for ground beef. I'm always looking for new vegetarian recipes that are healthy and yummy. This one looks like a keeper!! I am not a vegetarian but the recipe look so interesting. I've never heard of this soup before, but it sounds so yummy. We're having some cold nights coming up, so I think I might have to make this. I'll use frozen veggies because I don't like canned and add extra mushrooms. Thanks for the recipe. Yummy. I lvoe veggie soup. This one sounds amazing. I'm not a vegetarian..but I would definitely love to try this! That looks very good…but we don't do soy. this looks delicious and i love that its veggie! 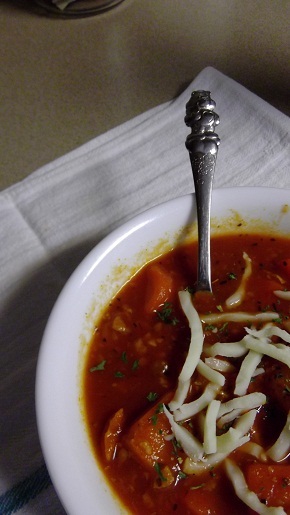 I love homemade soups and this sounds easy, delicious and nutritious, not to mention hearty! Thanks for the great recipe! I made this and my family loved it! This looks like something I could actually make! LOL! I'm no cook, but this looks easy enough… and I could easily make it vegan too! It looks delicious, I should try it once! This looks so easy and so yummy. Thanks for another great recipe in our repertoire! I made this the other day and it was delicious! I can't wait to make it for my husband when he gets back from deployment. This sounds so so so good; have to try it! Thanks, I am trying new vegetarian recipes. hard for this meat lover! This looks delicious! I really love V8 and tomato juices. My kids would love it too as long as I throu in a couple cans of whole peeled potatoes.. "Theyc an eat them right out of the can". OMG This recipe looks AMAZING! I recently started cutting right down on any meats, and have been indulging in the veggies! This is a welcomed addition to our dinner table for sure! Looks delicious to me but if the family knows it has soy crumbles in it they probably wont eat any of it . there are real picky. You talk about everything but the kitchen sink and pineapple. Have you ever eaten a chili with pineapple in it – called Hawaiian chili? so adding that can of pineapple might work ???? Mmmmm! I am certainly going to make this for dinner tonight! Yum! Great way to enjoy if you're a vegetarian! Even though I am not a Vegetarian this looks really good! This looks really tasty and simple. It looks like a soup that vegetarians and non vegetarians could enjoy which is a really good thing. I am a bug meat eater, but this soup looks delicious! I love soup and so I think I will give it a try. It is very yummy and super easy to make! Easy-peasy, delicous, healthy, customizable….what else could you want? I'd make mine chili-ish with lots of hot pepper flakes! Yum! This looks like a great way to use up all those random veggies that aren't quite enough for a dish on their own. I would love to try this. I love hamburger soup anyway. Looks so good!!! I will have to attempt this soup! Thank you for sharing. Sounds delicious! My sister-in-law is coming to visit shortly, and she is vegetarian, so I am trying to collect some recipes that I can use while she is here with us. Thanks so much for posting this! That looks so delicious, I'll have to give it a try. Not sure if my family would like it being vegetarian but I'd like to try it! I will have to make this soup sometime for something new;thanks for recipe. Yum, Yum, Yum!! I love this recipe. I have several friends that are vegitarians. When it's my turn to have the monthly dinner at my house I'm always scrambling to find a quick & easy vegi meal just for them. This is fantastic and simple…Another great recipe to add to my collection!! NOW THIS SOUNDS GOOD–THANKS FOR SHARING THE RECIPE..
omg this looks so good…going to nake it this week…thank you for sharing. I haven't seen Veg-All in years – guess I just wsn't looking for it! I sure will track soem down and make this recipe, though – looks great! Hello, I love the recipe idea, it sounds really good. I have been thinking about becoming a vegan for years but It's been challenging anyone have suggestions or how to wean yourself. I eat like only chicken and turkey now I do eat some fish at times….But really don't eat beef or pork ? hummm well maybe I am on my way. What y'all think? Great Recipe! My daughter is a vegetarian and is slowly turning me into one as well!! This looks great but I think I would add some chopped up “Morning Star” patties just to put some type of “meat” in the soup. I think my husband would be more prone to eat it then. Otherwise, I think it looks delicious! Yummy! I’m trying this recipe tonight! I love that you post vegetarian recipes. Most of the other (not all) websites that I visit seem to forget about us! This looks so good and simple to make. Namaste. I have a vegetarian friend who will be coming to my house for a potluck dinner every Friday and I’ve been looking for recipes so I can be sure there is something she can eat. Where does one find soy crumbles in the market? Frozen food section? The recipe sounds good! Yes, you can find soy crumbles in the frozen food section. At my local Wal-Mart, there’s actually a section for vegetarian products right by the frozen vegetables. This looks so good. I’m trying to eat healthier and I see all kinds of potential for this! Thanks for sharing! 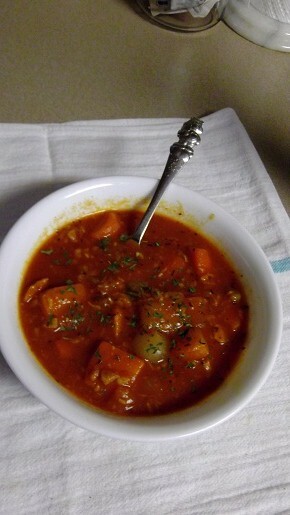 My husband has made something similar to this recipe before but as used red lentil instead. I think we will have to try your additions to the recipe next time we make it. Thank you for sharing! This does look super. I have been eating vegetarian for years now, and it wasn’t intentional. I haven’t tried soy crumbles, and I would like to try them with this recipe.